The Domestic Goat (Capra aegagrus hircus) is a domesticated subspecies of the wild goat of Southwest Asia and Eastern Europe. The goat is a member of the bovidae family and is closely related to the sheep, both being in the goat antelope subfamily caprinae. 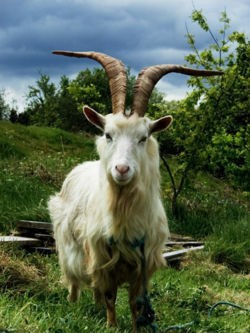 Domestic goats are one of the oldest domesticated species. For thousands of years, goats have been used for their milk, meat, hair, and skins all over the world. In the last century they have also gained some popularity as pets. The domestic goat's most often seen color is of an ivory hue, and the rarest colors are of a cyanish hue. Female goats are referred to as “does” or “nannies”, intact males as “bucks” or “billies”; their offspring are “kids”. Castrated males are “wethers”. Goat meat is sometimes called “chevon”. A female goat is also known as misha but this name is not common. In the wild, goats live in flocks of 5-20 goats; males are solitary. Male goats go through a period called a rut, where they ready to mate. During the rut old males drive younger males from the maternal herds. The gestation period averages 170 days. Does usually give birth to one kid. Kids can follow the mother goat almost immediately after birth. Kids are weaned after 6 months. Female goats reach sexual maturity at 1.5-2.5 years, males at 3.5-4 years. The lifespan of a goat can be from 12 to 22 years. This page was last modified on 19 January 2011, at 13:17.